If you’re thinking about traveling to the Caribbean, consider Aruba, a Dutch island that’s part of the Lesser Antilles. Most Caribbean islands experience frequent tropical storms and humidity. Aruba, on the other hand, is host to a climate that is arid and dry. 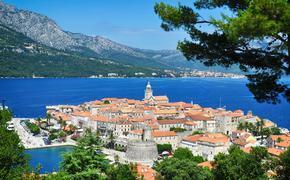 It’s an island that experiences sunshine year round and is far enough south to dodge almost any hurricane. Aruba’s near perfect weather can be described as one of its most endearing qualities, along with picturesque beaches, a thriving restaurant culture, and countless attractions. The fact that there is so much to do in Aruba poses a bit of an accommodation quandary. Should you stay at your standard hotel with no meal plan, or is it worth it to book a hotel with all-inclusive amenities? The answer to this question depends on your reason for visiting Aruba in the first place as well as your personal travel style and interests. For some Caribbean destinations like Punta Cana and Jamaica, it’s not uncommon for guests to go their entire vacation without leaving the resort. If your idea of a great vacation includes hanging out by the pool with a pina colada before relaxing on the beach, then staying at an all-inclusive resort might be right for you. You won’t have to worry about meals, drinks, or anything really. You can just show up and enjoy. Hotels with all-inclusive plans typically cost more up front than the hotels without these kinds of inclusions. However, if you plan on spending a lot of time at the hotel eating and drinking, staying somewhere all-inclusive could be more economical overall. Aruba is also a wonderful place to get married, especially with the slim chance for rain on your wedding day. I recommend all-inclusive resorts like the Barcelo Aruba (J.E. Irausquin Blvd 84, palm beach), Riu Palace (J.E. Irausquin Blvd 77, Palm Beach), or Divi Aruba (J.E. Irausquin Blvd 45) for large groups and destination weddings. It’s easier for guests to budget appropriately when they know exactly how much their trip will cost in advance. Furthermore, it’s always nice to enjoy group activities and dining without worrying about who’s going to pick up the check. 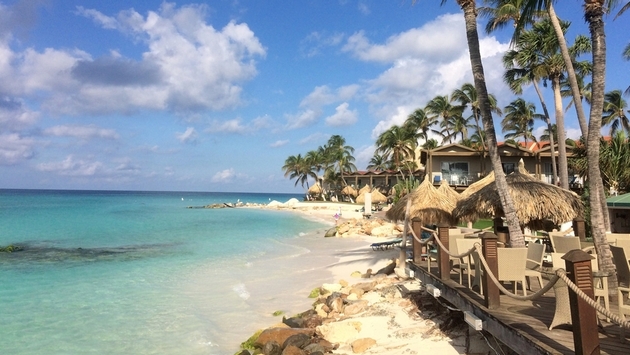 Most of Aruba’s all-inclusive resorts are located along Eagle and Palm beaches, where the soft white sand feels like baby powder between your toes. Of all the islands I’ve been in the Caribbean, I’ve found Aruba to have the most consistently clear water. I also found the water temperature to be the most comfortable. 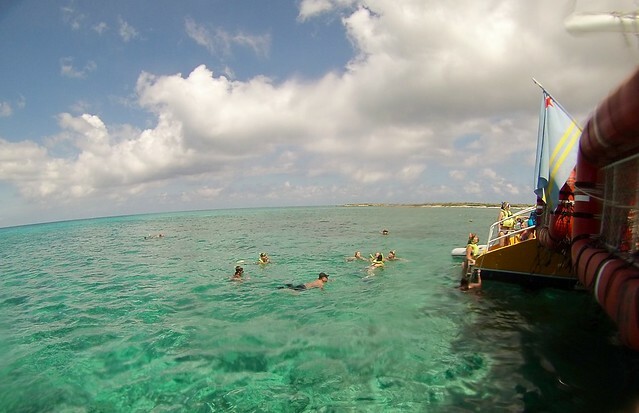 The excellence in water quality and visibility makes Aruba a popular destination for those who enjoy activities at sea. The island is surrounded by vibrant coral reefs, home to colorful fish of all shapes and sizes. Aruba has also been called the shipwreck capital of the Caribbean. The ruins of many lost vessels remain, serving as unique underwater historical sites to explore. There are some small reefs that are accessible from the beach, like the one I swam to from the all-inclusive Riu Palace. Snorkeling gear, as well as other non-motorized water sports, are included as part of the Riu’s amenities. If this is all the snorkeling you need on your trip, then the Riu Palace might be a great place to stay. 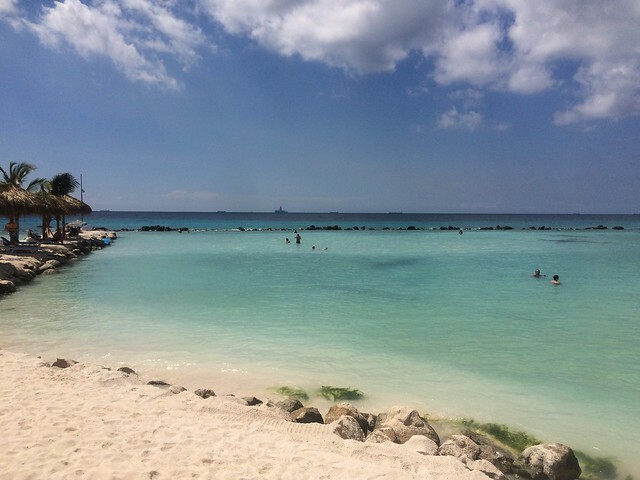 READ MORE: What’s The Secret To Aruba’s Tourism Success? You could also consider joining a half day all-inclusive snorkeling boat trip with DePalm Tours (not included with your stay at the Riu). It departs from a pier that’s conveniently located between the Riu Palace and the Hilton Aruba (J.E. Irausquin Blvd 81, Noord). No matter where you stay on Palm Beach, I recommend this fun catamaran cruise, which stops at various shallow reefs and shipwrecks. DePalm Tours also books half day reef excursions for “snuba” or to ride in a submarine. On the other hand, if you are more interested in scuba diving or want to get your PADI scuba certification, you may want to stay somewhere that is not all-inclusive. The reasoning behind this is because scuba diving is a bit more time intensive. Just the beginning PADI open water certification takes several days. This means if you are going to Aruba for diving, you probably won’t be spending very much time at the hotel. Therefore, opting for an all-inclusive plan might not be the best choice. “Aruba is a destination where you can easily go out and experience all that the island has to offer. Since the locals speak four languages, it is easy to interact and learn insider tips.” My friends and I decided to do just this, so we rented a jeep and drove around the entire island. From the California Lighthouse in the north to Baby Beach in the south, this was by and large the highlight of our trip. We discovered countless beaches along the way. For some, it was easy to go snorkeling off shore, like the shipwreck we found off the coast of Malmok. The northern part of the island is rough and rugged as a result of the dry climate and powerful trade winds. For this reason, there aren’t many buildings along the north coast. Yet, it’s an exhilarating place to go off-roading with spectacular rock formations, coves and natural bridges. Start at the lighthouse and make your way east along indistinct dirt paths that traverse the sand dunes. Along this route there are historical sites, like the ruins of an abandoned smelter mill and gold mine. Another place to visit is the Arikok National Park, where you can explore various caves and admire the cacti-speckled scenery. For a seriously intense off-roading experience, take the jeep down to Aruba’s natural pool. This drive is not recommended for the faint of heart! Get ready to push your off-road skills to the limit as the terrain is quite steep and incredibly rocky. For thrill seekers, a drive to the natural pool is a blast! The pool is full of tropical fish and shielded from the ocean by a wall of boulders. I recommend you wear a bathing suit and pack water shoes for this trip. You will also need to bring your own snorkeling equipment. We ended in Oranjestad, which is Aruba’s largest city. It’s also the place where the cruise ships dock. There’s no shortage of entertainment around the port with numerous restaurants, bars, cafes and shopping malls. For one of the most posh and romantic sunset dining experiences, make reservations in advance for a table at Passions on the Beach. While shoes may be optional at this upscale beach restaurant, which is affiliated with the Amsterdam Manor (J.E. Irausquin Blvd, Noord), it’s the kind of place where you might run into a celebrity or witness someone get a marriage proposal. If you’re looking for fine dining but still want all-inclusive, you can have it all at the Manchebo Beach Resort & Spa. Their optional all-inclusive plan includes healthy, gourmet options as well as one restaurant meal off-property for guests who stay for four nights or more. Manchebo is a boutique hotel situated on one of Eagle Beach’s most pristine locales. In fact, the beach surrounding this resort is so picture perfect that you might think it was photo-shopped or pulled from a postcard. The overall atmosphere is more relaxed Caribbean, in contrast to many of Aruba’s high-rise hotel options. The resort’s concept revolves around personal wellness. Manchebo has a beautiful spa that offers relaxing beachfront massages and treatments, as well as complimentary yoga and pilates classes offered daily. There’s also a breathtaking wedding pavilion on the beach, perfect for couples who want to tie the knot somewhere more high-end and intimate. Keep in mind that all-inclusive plans limit your dining options, even at paradise resorts like Manchebo. For example, my friends and I developed a love/hate relationship with the Riu Palace because we thought the restaurants closed too early (a la carte restaurants close at 9 p.m., buffet closes at 10 p.m.). Guests who eat late have to order from room service, but the menu is sparse and restricted to their room. I learned this when my friends arrived on a late flight and they wouldn’t let us order room service from the lobby. Another setback we encountered at the Riu Palace was the difficulty in getting into a la carte restaurants. For this reason, we ended up eating most of our meals at the buffet. On the bright side, we found the buffet food at the Riu to be just as good as the a la carte restaurants with the added bonus of not having to wait for service. We gorged ourselves on the unlimited steak, lobster, sushi and caviar. We also enjoyed all the decadent desserts and thought the chocolate fountain was a nice touch. “All-inclusive [resorts] are good for the traveler on a budget or the ‘drinker’, though drinks are not premium brands.” If you are looking for a drinking hole that’s not part of a hotel but still easy on the wallet, I recommending an establishment on the pier in Palm Beach called Bugaloe (J.E. Irausquin Blvd 79, Noord). 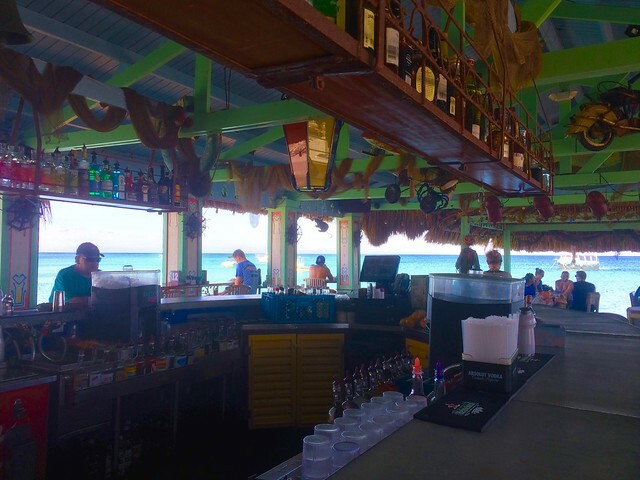 This vibe of this bar is Caribbean chill with a live band and pocket-friendly happy hour specials. Meanwhile, if you don’t drink but still want to have meals included, or maybe you prefer more top-shelf liquor options, guests who stay at the Renaissance Hotel (L.G. Smith Blvd 82, Oranjestad) have the opportunity to choose between various meal plans. They also have access to the hotel’s private island, where they can mingle with live flamingos and iguanas before eating delicious fire oven pizzas at The Papagayo Bar & Grill. Personally, I like to enjoy the best of both worlds. I spent half of my vacation staying at the Hilton Hotel Aruba with breakfast included. Then, I walked next door to spend the other half of my trip at the adults-only Riu Palace Antillas with all-inclusive amenities. It’s wonderful that Aruba has so many options, enabling visitors the ability to customize their vacation. No matter your travel style, chances are pretty good you’ll fall in love with Aruba, an unsurpassed island paradise where adventure awaits.